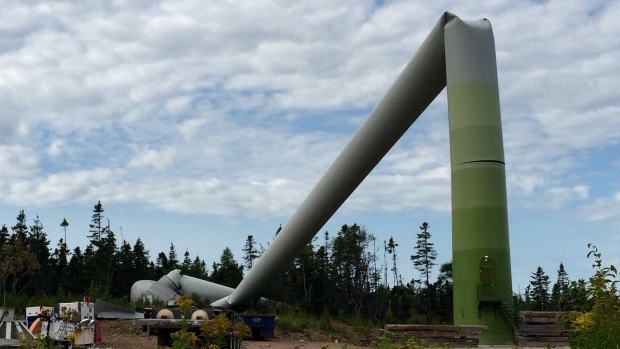 An 80-metre wind turbine has collapsed in Nova Scotia, prompting an investigation by Enercon, the device’s manufacturer. According to company officials, no one was injured when the turbine fell Aug. 17 at the Point Tupper Wind Farm. Nova Scotia’s Department of Energy confirms they are aware of the collapse. Crews were performing regularly scheduled maintenance on the turbine, exchanging a large component, said Karine Asselin, business development manager with Enercon, via phone from the company’s national headquarters in Montreal. “An incident occurred and it triggered the evacuation procedure,” Asselin said. All personnel had time to evacuate the site before the turbine collapsed, she confirmed. The cause of the collapse is now under investigation, with a team of experts on site. The other 10 turbines in the vicinity are still operating. Enercon is a major player in the Nova Scotia wind power community, with its turbines generating 260 megawatts of electricity – enough to power thousands of homes. She said the goal is to find out what happened, implement the findings and restore the site to full operations.